Aboard the derelict sub, the girls find a clean boat, chocolate…and a kind of patchwork history of everybody and everything that came before them, thanks to the camera auto-syncing with the monitors on the bridge. In addition to all the pictures they took, and those Hanakawa took before them, the camera is a veritable cornucopia of visual (and audiovisual) information. The content ranges from simple images of life and death, to the reports of a school robotic research club, to news reports of a worsening geopolitical situation that leads to large-scale war and genocide. 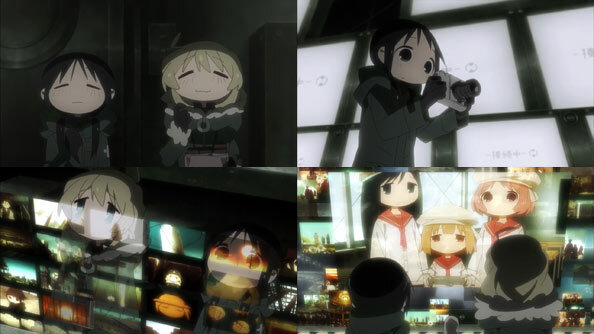 On the whole, though, Chito and Yuuri feel less lonely, now that they were able to watch how others lived. Suddenly processing more information than they ever had before proves exhausting for the girls, who fall asleep under the consoles and dream of their escape from their town. When Chito wakes, she’s too late to do anything about Yuuri getting swallowed up by a giant version of Cut. Chito suspects Cut might’ve been some kind of lure used by the bigger ones, but Cut’s body language suggests that’s not the case. 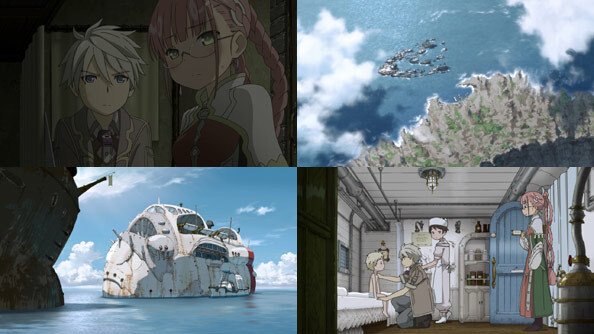 Chito runs through the submarine, desperate to find her one and only companion, and eventually emerges from the conning tower to find the Big Cut isn’t interested in eating living humans, and spits Yuuri out. It then transforms to reveal it’s a kind of semi-sentient mushroom. The mushroom has a mix of good and bad news…though I guess it’s mostly bad for humanity. They are systematically ridding the earth of toxins leftover from the human population after it destroyed itself with war. 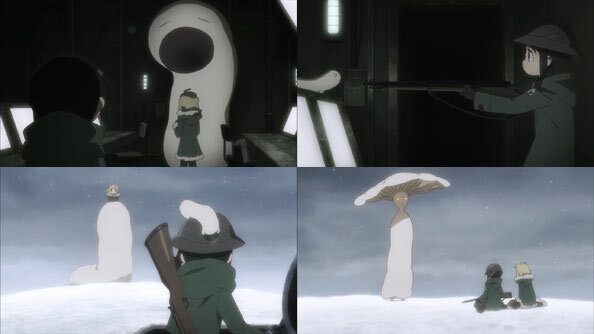 Yuuri and Chito are the last two humans left, by the mushrooms’ reckoning. All machinery will shut down around them, and after they’ve passed away, the world will enter a period of rest and inactivity, as the mushrooms hibernate. With that all said, mushrooms emerge from the nuclear missile tubes of the sub and they all ascend into the sky, likely to start “cleaning” the higher levels. There’s not much for Chito and Yuuri to do but continue on their tour, with the goal of reaching the highest level. 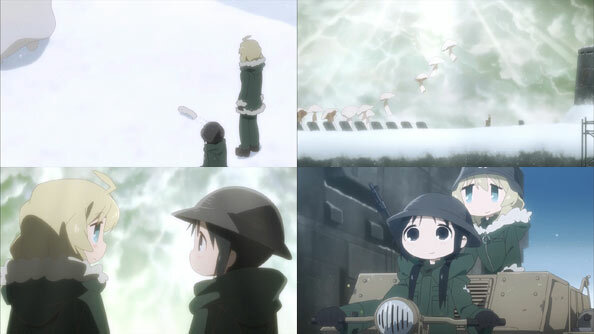 Even with their companion/pet Cut gone off with its brethren, Chito and Yuuri aren’t lonely, nor do they care if the world ends, because they have one another. 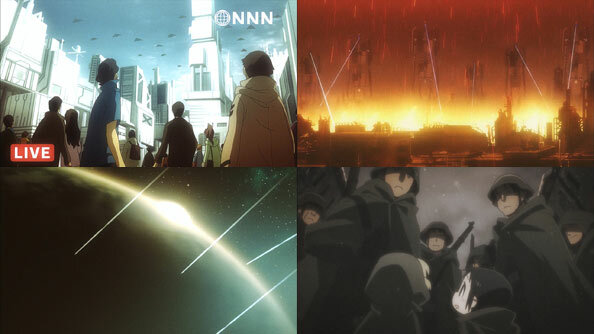 As with so much relating to this show, it’s simultaneously a deeply bittersweet ending, conveying the lesson to not be troubled by things life you can’t control (like the ending of the world) and take comfort in those you can—like who you choose to spend your days with. This week, while waiting for Riko to heal, Nanachi teaches Reg the “true nature” of the abyss, calling it, essentially, a physical, if invisible, trap of barbs that are easy to descend through but quite difficult to ascend. The Abyss itself is both something that doesn’t want anything going in, but also won’t let anything that does get in get out easily, or without exacting a toll. That toll would seem to extend all the way tot he surface, where lil’ Kiyui (Kiwi) has come down with an awful fever; a growing trend that is claiming lives. When Girou (Gilo) takes him off the island onto one of the ships of the “Caravan Fleet” docked there, he recovers immediately, without any medical treatment. It would seem that all that was needed was to get further away from the Abyss. And yet Riko, like her mother Lyza, her mentor Ouzen, and Nanachi and Mitty, couldn’t help but get closer and closer. The longing to reach thebottom of the netherworld and discover its secrets is far more agonizing than any trap, predator, poison, or curse. It’s a curse in and of itself; an infinitely seductive world beneath the surface, simultaneously beckoning and warning. Good News: Mitty isn’t trying to eat Riko, she’s merely being friendly, and as Nanachi says, uncharacteristically “emotional” toward a visitor (though it’s doubtful they have many other visitors). She also points out Mitty was once a girl like Riko, then demonstrates to Reg how terrible her cooking ability is, prompting Reg to commit to cooking for RIko once she wakes up. Meanwhile, Nanachi uses a thin, transparent “fog weave” to very effectively demonstrate the physical qualities of the Curse of Abyss; how it morphs to take the shape of whatever it covers, and the consequences of recklessly bursting through it. Back in the hut, we’re “treated” to one of the more disturbing sequences in the show: Riko, covered in a fleshy film of her own, sits in the pitch black darkness but for a hole, through which Mitty’s eye peers. Riko peers back, and hears not the cooing and moaning of the present Mitty, but the more lucid cries of the girl Mitty once was. Chilling. Continuing her lessons, Nanachi places a device in Reg’s helmet so she can communicate with him in real time from afar as he responds to a call for help from a Black Whistle, who then bristles when he sees a mere child has answered and begs him to flee. 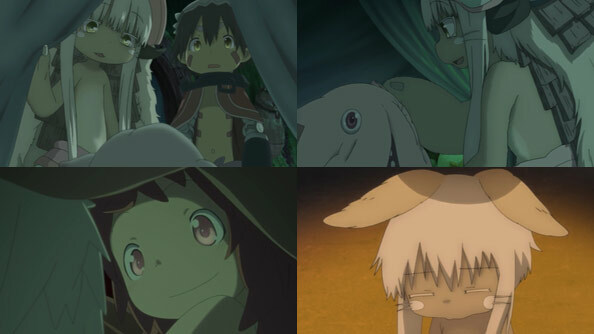 Of course, Reg isn’t an ordinary kid, and he has a score to settle with this particular piercer, so with Nanachi’s aid he reaches out and grabs the curse, (which the piercer uses to predict the future with its red “nose”) and fires Incinerator at point-blank range, forcing the beast to shed 80% of its quills and withdraw. Even being almost killed won’t sate Riko’s longing to continue, and Reg knows that, so whenever she wakes up and is well and strong enough to do so, they’ll resume their descent. Reg, grateful for all of Nanachi’s help, asks if she’ll accompany him and Riko on their journey. It’s not that Nanachi outright refuses their offer, but has a request of her own that is more pressing: she asks if Reg will kill Mitty for her. We heard through Riko the misery Mitty lives in each and every moment; almost gone but not gone enough for it to not matter. Barring some kind of miracle that could save her, killing Mitty would seem to be a mercy; it’s just that after what happened with them and Bondrewed, Nanachi hasn’t been able to herself do what she know needed to be done. She hopes there’s enough emotional separation for Reg to do it instead. Thanks to the careful ministrations of Nanachi the Hollow, Riko’s arm is stabilized and she’d given another 12 or so hours of life to play with. 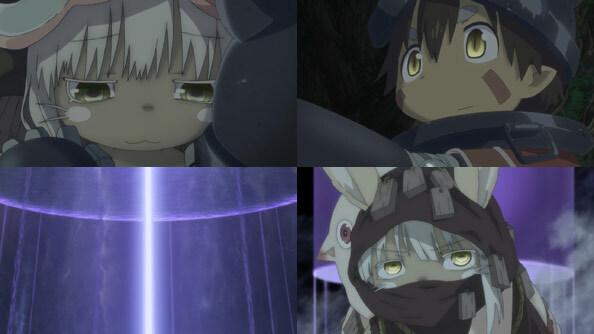 Turns out Nanachi had been shadowing her and Reg since they reached the Fourth Layer, but only revealed herself out of pity for Reg, who mewled like a “lost little kid” when Riko went blue. She warns Reg Riko is far from out of the woods: to save her life, he’ll have to go back out into the Goblet to collect a number of items within those 12 hours. Then another sound comes from the tent, and Nanachi introduces Reg to OH GAAAAAAAH JESUS CHRIST WHAT THE HELL IS THAT … THAT THING? Honestly, after the “meat” Ozen brought back to life and last week’s gruesome ordeal, you’d think I’d be more desensitized to the horrors of the Abyss, but “Mitty” provides another, well, layer of darkness and dread. Mitty is…well, hollow. For most humans who undergo such a transformation, death by their comrades usually follows, but not in this case. Nanachi not only hasn’t put Mitty out of her misery, but keeps her around like a kind of pet. Perhaps it’s an act of penance. In some flashes of the past we see what is probably a pre-ascent Mitty—a girl with eyes the same reddish hue as the eye of post-ascent Mitty—and a younger, post-ascent Nanachi being praised by the White Whistle Bondrewd the Novel, who is happy “the experiment” was a success. 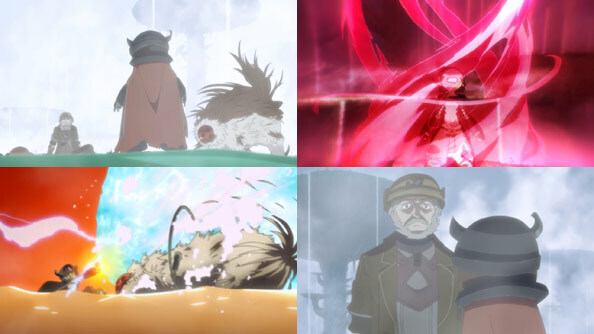 Perhaps Nanachi and Mitty were the subjects of that experiment, and only Nanachi survived (relatively) intact. 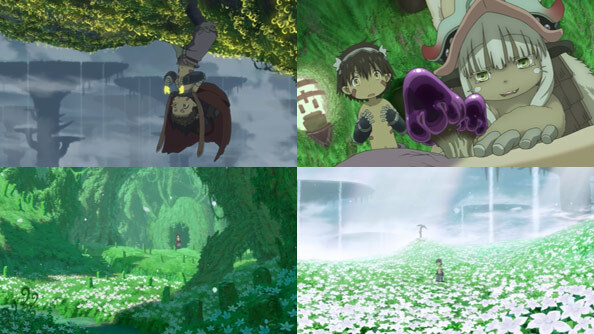 Reg collects all the items on Nanachi’s list without too much difficulty, only to learn that just one of those items—the purple mushrooms that grow on shroombears—was necessary to save Riko; the other things were merely for Nanachi to eat. But Nanachi makes a good point: she cannot forage for food while tending Riko, so someone had to. Reg is also instructed to wash Riko’s soiled clothes at a nearby riverbank behind Nanachi’s hut. The utterly gorgeous verdant landscape he beholds is peppered with graves, somewhat souring the awe with melancholy. But Reg starts seeing things – the field of flowers of fortitude, Blaze Reap marking a grave – and also hears his own voice speaking to Lyza. He wonders if he buried Lyza, but remembers Ozen said “no one was buried” there. The thing is, “no one” could be construed as “nothing human”—i.e., a hollow—but when back in the tent, what’s left of Mitty suddenly approaches a sleeping Riko. Does this behavior suggest that Riko’s presence is somehow drawing out the humanity in Mitty, like the mushrooms are drawing out the piercer’s poison? Does Mitty recognize Lyza’s daughter? In the most bizarre and surreal episode of WagaMoDo, the newly-restored duo of Kae and Shina suddenly declare they have to go on a pilgrimage to the resting place of Hyakki Sametora, the feudal lord upon which the Lord in their anime is based. The only truly enthusiastic guy is the history buff Mu, but the other three tag along nonetheless. Reasonably priced-but-not flashy hot spring innage ensues. The night they stay at the inn, Iga accidentally falls on Kae during a pillow battle, and her reactions indicate to Iga that she didn’t dislike that accident. 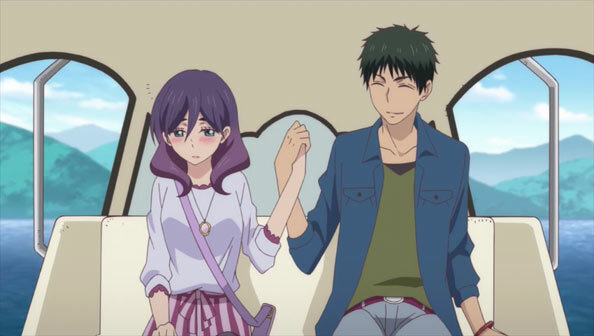 When they end up on the same swan boat (to the possibly cursed island where the lord’s head is believed to reside), he takes her hand and tells her if she’s not used to being so close to a guy, to get used to it…and she does not protest. Unfortunately for Iga (but fortunately for us), when a sudden storm maroons the group on the island, Kae ends up rescued by Mu (while Iga has to give Nana mouth-to-mouth; an event Shina captures from many angles with her waterproof phone). 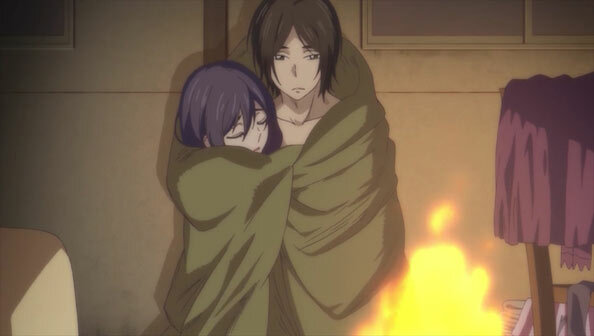 When Kae collapses from fever, Mu has no choice but to get her to shelter, disrobe her, and use his body heat to get hers up. He does so with the utmost gentlemanliness, while Kae is too out of it to be embarrased. 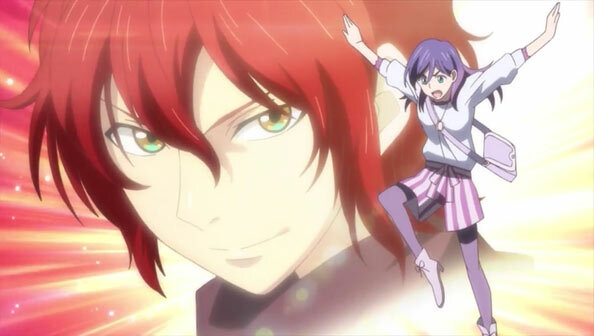 After that…things kinda go off the rails, as the show suddenly picks up a lot of supernatural elements. The ghost of the lord makes the others walk around in circles, then attacks Kae and Mu, who use the charms they bought at the gift shop to neutralize him. Eventually Kae “exorcises” Sametora when he realizes his legend is not a negative one (thanks in part to the anime that pretties him up and makes him either a top or bottom). All the supernatural elements are (mostly) explained at the very end once the group gets to shore by a very unexpected and hilarious twist: the restaurant where they ate lunch accidentally used hallucinogenic mushrooms, so they were tripping balls the whole time, likely including during the storm and “lake whirlpool”. Overall a pretty fun episode.